Q: According to reports, the Chinese Consulate-General in Karachi, Pakistan has been attacked today. Can you offer some details on what happened exactly? A: According to the information at my hand by far, at around 12:00 a.m. Beijing time, three illegal militants were caught by Pakistani police when they attempted to break into the Chinese Consulate-General in Karachi. All the three militants were killed and two Pakistani security personnel lost their lives in the shootout. All the staff of the Chinese Consulate-General in Karachi and their families are safe. Pakistani Prime Minister Imran Khan has sent condolences to the Chinese Consulate-General in Karachi. 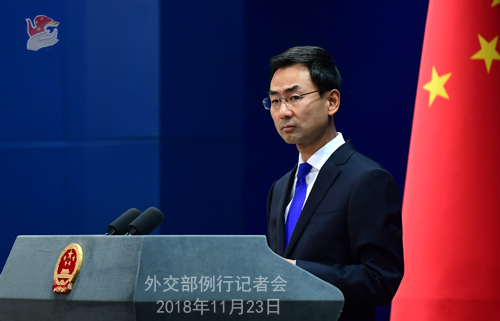 China strongly condemns any violent attacks against diplomatic and consular missions and has asked Pakistan to take concrete measures to ensure the safety of Chinese citizens and institutions in Pakistan. In the meantime, we mourn for the Pakistani security personnel who were killed in the line of duty and send condolences to the bereaved families and those injured. Q: The Baluchistan Liberation Army in Pakistan claimed responsibility for this attack on the Chinese Consulate-General in Karachi. How does China comment on this organization's record in the past and its claiming responsibility? Can you confirm that it is this organization that attacked the Consulate-General? A: As far as I know, the Pakistani side is conducting investigation into this incident. Q: Yesterday, you told us about the upcoming visit to China by a UN delegation comprised of permanent representatives of the Security Council members in your answer to a question raised by a journalist. Do you have more details on that? A: As the rotating Chair of the UN Security Council for November, China will invite the permanent representatives of all member states and the member states-elect of the UN Security Council, the main troop contributing countries of the UN peacekeeping operations and senior officials of the UN Secretariat to visit China from November 25 to 28. During the visit, Chinese leaders will meet with the delegation. The delegation will visit the China peacekeeping standby force and travel to Guangdong. It is believed that this visit will help the members of the Security Council to get a better understanding of China's development path and foreign policy and help Chinese people from various sectors to know better about the UN and its Security Council. It is also conducive to strengthening solidarity and cooperation between China and other Security Council members and enabling the Security Council to play a better role in international affairs. Q: Did the gunmen at any stage actually enter any part of the grounds of the Consulate? And also on Pakistan's television, there are images being shown of black smoke rising from the Consulate. Do you know what that black smoke is? A: According to what I have learned, the militants didn't enter the compound of Chinese Consulate-General in Karachi. The shootout happened outside the Consulate-General. Follow-up: So that black smoke would also possibly be outside and not inside the grounds of the Consulate? Is that right? A: The militants didn't enter the compound of Chinese Consulate-General. Q: Philippine Foreign Secretary said in an interview that the Philippine side was willing to disclose the contents of the Memorandum of Understanding (MOU) on Cooperation on Oil and Gas Development signed with China and would ask for China's approval for doing that. Do you have any information concerning this and what are your reactions to the remarks of the Philippine side? A: Many of our journalist friends are very interested in this issue these two days. Recently, during President Xi Jinping's visit to the Philippines, China and the Philippines signed the inter-governmental Memorandum of Understanding (MOU) on Cooperation on Oil and Gas Development as witnessed by the two heads of state. The cooperation on oil and gas development is an important consensus reached by the Chinese and Philippine leaders. China and the Philippines have all along maintained close communication on this matter. Early this year, the two sides set up an oil and gas task force under the China-Philippines Bilateral Consultation Mechanism on the South China Sea (BCM), exchanged views on cooperation on maritime oil and gas development for several times and had in-depth exchanges on the signing of relevant cooperation document at various levels. After communication and negotiations, the two sides reached agreement on signing relevant inter-governmental MOU and successfully inked it when President Xi Jinping visited the Philippines. All through the process, the two sides demonstrated pragmatic attitude and positive will to develop China-Philippines friendship and deepen bilateral cooperation. The signing of the MOU is a testament to the mutual respect, equal-footed negotiation and mutual trust between China and the Philippines. The MOU appraises the progress made by the two sides in exploring dialogue and consultation as well as practical cooperation in accordance with the UN Charter, the United Nations Convention on the Law of the Sea of 1982 and the 2002 Declaration of Conduct of Parties in the South China Sea, recognizes the important contributions the two sides have made to regional peace, stability and development through concerted efforts, and pledges to accelerate oil and gas development cooperation at sea with the principle of mutual respect, fairness and mutual benefit, flexibility and practical results and consensus and in line with international law. According to the MOU, the two sides will set up an inter-governmental joint steering commission and inter-enterprise working group and decide relevant cooperation arrangement at an early date. The relevant cooperation will not affect the respective legal stance of the two sides. China and the Philippines will continue to stay in communication on the implementation of relevant follow-up matters and strive for substantial outcomes in the joint maritime oil and gas exploration and development, so as to benefit the two countries and peoples. As to the question concerning the disclosure of the MOU, I already replied to that yesterday. Whether a MOU can be made public depends on the understanding reached between the two sides during the negotiation process and the relevant specific provisions in the text of the document itself. As far as I know, this MOU is not a confidential agreement. If the Philippines wants to disclose it, China is open to such arrangement. Q: According to Wall Street Journal, the US officials contacted the relevant government departments of Germany, Italy and Japan, saying that the US believes that using the devices produced by Huawei will pose risks to cyber security and that they should not purchase them. What is your comment? A: I am not aware of the specific case you mentioned. In principle, the Chinese side always encourages Chinese enterprises to conduct foreign investment and economic and trade cooperation on the basis of abiding by the local laws and regulations. Meanwhile, we hope that relevant countries can provide a fair, just and predictable environment for the investment cooperation carried out by the Chinese companies. Q: President Xi Jinping is going to visit Portugal next month. The high-level visits have been more frequent in the past few years and there have also been big Chinese investments in banking and energy in Portugal. Could we expect more investment in productive capacity that the Portuguese authorities have been pushing for? 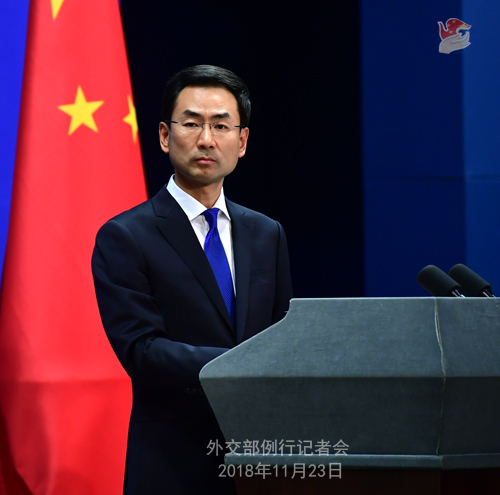 A: This morning, the Foreign Ministry held a press briefing on President Xi Jinping's upcoming state visits to Spain, Argentina, Panama and Portugal and his attendance at the 13th G20 Summit. Regarding President Xi Jinping's visit to Portugal, China and Portugal are located respectively at the eastern and western ends of the Eurasian continent. Although our two countries are geographically far away from each other, our two peoples have always held friendly feelings towards each other and their exchanges boast a long history. Since the establishment of diplomatic ties in 1979, the bilateral relations have maintained sound and steady development. In 1999, our two sides properly resolved the Macao issue through friendly consultations. In 2005, our two countries established the comprehensive strategic partnership, which opened a new chapter for the growth of bilateral ties. Now China and Portugal enjoy frequent high-level exchanges, strong political mutual trust, remarkable achievements in the practical cooperation in such areas as economy, trade and investment and ever-closer cultural and people-to-people exchanges. Next year we will mark the 40th anniversary of the establishment of diplomatic ties between China and Portugal, which will present rare opportunities for the growth of our bilateral relations. The Chinese side highly values its ties with Portugal and views Portugal as a good friend and partner in the European Union. We are willing to work with Portugal to take President Xi Jinping's upcoming visit as an opportunity to continuously deepen political mutual trust, expand the mutually beneficial cooperation under the framework of the Belt and Road Initiative, maintain close exchanges across the board, step up coordination in international and regional affairs and scale the China-Portugal Comprehensive Strategic Partnership to new heights. Q: Are you aware that were there any attackers who were not killed and got away? And also what is the impact on the operations of the Consulate? I assume that it is currently closed as the crisis is going on. Is that right? Do you know how long that might be the case? A: Just as I said, according to the information at my hand at this point, three illegal militants attempted to break into the Chinese Consulate-General in Karachi, and all of them have been killed. As far as I know, the Consulate-General is now closed. Q: The Pakistani security forces have responded very quickly and overcome the attack and killed all militants. How does China comment on the response of Pakistan? A: The Pakistani side took timely and effective measures to protect the safety of the premises and staff of the Chinese Consulate-General in Karachi, and the Pakistani security personnel even lost their lives in the shootout. We highly appreciate the efforts made by Pakistan, mourn for the Pakistani security personnel who were killed in the line of duty and send condolences to the bereaved families and those injured. Q: The 21st round of India-China border talks are due to start today. Can you just tell us have they started in Chengdu? What is the schedule like? A: I already talked about that the day before yesterday. I have no further details to offer to you at this point. After the meeting, we will release relevant information in a timely manner. Q: Can you confirm reports that China has resumed buying Iranian oil after the US waiver on sanctions? A: According to my information, the normal cooperation between China and Iran in energy and other areas has never been interrupted. Q: On the attack on the Consulate, will this have any impact on the Chinese investments in Pakistan and the China-Pakistan Economic Corridor? A: China and Pakistan are all-weather strategic cooperative partners, and the practical cooperation across the board between the two sides has brought tangible benefits to the two countries and peoples. Building the China-Pakistan Economic Corridor (CPEC) is an important consensus reached by the leaders of the two states, which is of key significance to promoting peace, stability, development and prosperity of the two countries and the region. It has won extensive support from the people of the two countries and is being advanced in an orderly way. China will continue to work with Pakistan to steadfastly promote CPEC and bring greater benefits to the people of the two countries and other countries in this region. Q: You said China and Pakistan will continue with the building of CPEC. Do you think there needs to be additional security measures, especially given that this is not the first attack by people saying that they want an independent Baluchistan? A: China highly appreciates the efforts made by Pakistan to safeguard CPEC and ensure the safety of Chinese citizens and institutes in Pakistan. We believe Pakistan will continue taking effective measures to ensure the development of CPEC in a safe and smooth manner.